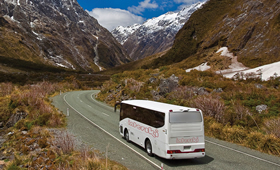 Welcome to our dedicated Coach Operator page, with thanks for your interest. This page is here to give you some background information about Interski, who we are and how we operate, and also to explain the unique contract we offer our carefully selected Coach Operators, which protects against fluctuations in both fuel and currency rates. Once you have read through our information, if you would like to be considered as one of our transport providers, please complete the New Coach Operator Application Form and we will contact you. We operate exclusively to the Aosta Valley, NW Italy, using three resorts – Courmayeur, La Thuile, Pila. Depending on the season, we anticipate 12,000 – 14,000 clients. The majority of our holidays involve executive coach transport, with up to 300 ex-UK departures between the months of December and April. Standard tours involve Saturday departures, 6 nights in resort, with return arrival in the UK on Sunday am. An increasing number of clients opt for 5 night tours, with vehicles returning to the UK on Saturday (cost differential). The resort operation is refined, efficient, effective – staffed by a talented, experienced team. Back-up, help, information and assistance are never far away, and always in abundance. Full documentation – registration number, insurance, operator licence, recovery/rescue back-up. Professional crews, seriously customer-focussed and CRB checked. Very simple. Transport to and from Italy (Dover/Calais P & O) with daily transfers hotel/main ski lifts am and pm. Evening work involving transfers hotel/variety of après-ski venues/events. On signature of contract, substantial deposit per liveried vehicle. Balance payment, per vehicle, during the week following return (Sunday). End of programme reconciliation. A unique system, conceived to eliminate Operator risk, to protect against fuel and currency fluctuations and to provide prompt and regular income during the programme. A core payment, taking into account distance from Operator base to Dover and bearing in mind the necessity (or not) for feeder drivers. A UK fuel payment based on 10 mpg and accurate mileage/km. The fuel cost/litre is declared at the beginning of each month, and applies to all departures within that month. A continental fuel payment based on 10 mpg and accurate mileage/km CALAIS/RESORT/CALAIS, and including 200 in-resort miles. The continental fuel cost and value of £/€ (tourist rate) are declared at the beginning of each month and apply to all departures within that month. A continental tolls and Mont Blanc Tunnel payment. £/€ (tourist rates) values are declared at the beginning of each month and apply to all departures within that month. Each Monday, Interski provides an estimated calculation of variable costs above for the vehicles returning the Sunday prior. Subject to mutual agreement - Interski/Operator - these costs, together with the core payment, are provided on the Wednesday/Thursday. Core payment, UK mileage/km, continental mileage/km, continental tolls and Mont Blanc Tunnel – paid weekly. 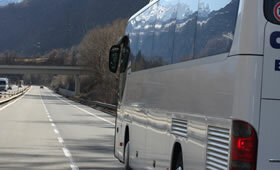 A number of Interski resort staff are qualified coach drivers. For logistical reasons, they may be required to drive the Operator's vehicles in resort (departure day shuttles/double runs etc). If you'd like more information about becoming part of our team , simply fill in the enquiry form below and we'll be delighted to send you more information. Your interest in working with Interski has been noted and forwarded to us. 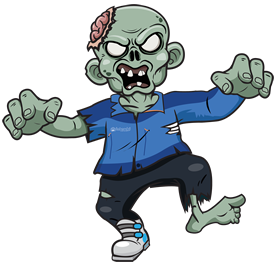 We will review the details and be in touch with you in the near future. In the meantime, please feel free to contact us on either 01623 456333 or by email to email@interski.co.uk.